https://matcha-jp.com/en/948 Try An Omikuji Paper Fortune At Sensoji In Asakusa! Try An Omikuji Paper Fortune At Sensoji In Asakusa! Senso-ji - the ever-crowded temple in Asakusa is a great place to learn your future via omikuji. There is a rumor about the omikuji paper fortunes at Senso-ji, but what is the truth? Senso-ji: the ever-crowded temple in Asakusa. In this place overflowing with people’s enthusiasm, there is a rumor that has been handed down over many years. This rumor is related to omikuji, or paper fortunes… but before talking about that, let’s try and draw an omikuji for ourselves. This is the main office that is located in front of Senso-ji’s main temple building. 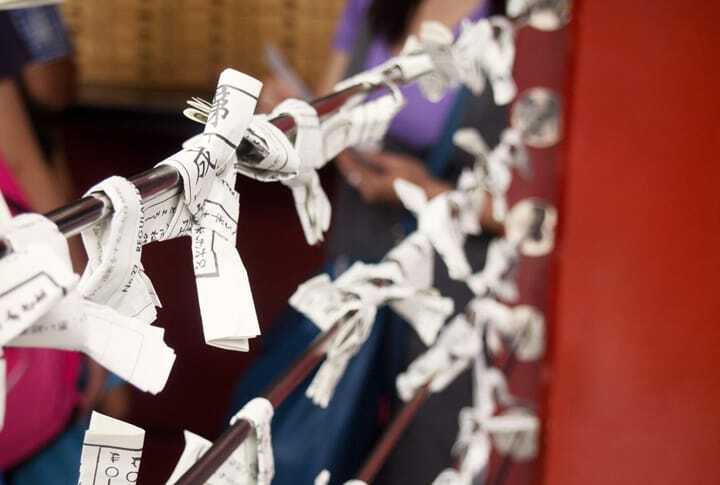 An omikuji is a strip of paper that predicts your fortune when you make a prayer to the gods and Buddhas of a given temple or shrine. The contents written on that small slip of paper shows your future. Did you know that there are 7 types of results for omikuji, ranging from the best daikichi (大吉excellent luck), to the worst daikyou (大凶terrible luck)? One omikuji at Senso-ji costs only 100 yen. Place a 100 yen coin through the hole into the money collection box by yourself. When you’ve inserted the money, shake the omikuji box several times on its side. You will hear a neat shaka shaka sound, and naturally get excited. An omikuji rod will poke out from a hole in the box. The characters written on it, seen in the red box, mean 88 in Japanese. Now, search for the drawer labeled number eighty-eight in the shelves located right next to the box (try to match the symbols on the rod to the drawers, or ask someone for assistance if you can't read Japanese), and take one omikuji slip. In this moment, you're sure to feel excited no matter how old you are. Oh wow, we got daikichi (excellent luck)! You might be excited enough to cheer, and the people around you are sure to feel jealous or surprised. Some might even say that you must be blessed, to have gotten daikichi at Senso-ji of all places. Next PageNext Page: There's a rumor about the charms at Sensoji?! Find out more about it!